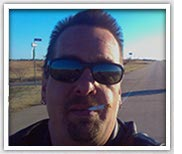 I’m just a regular guy who loves motorcycles, music, writing and a friendly game of pool every once in awhile. I also love fishing and watching “B” movies. I’ve enjoyed a few professions thus far and none much like the other. I was fortunate enough to work for many years in the entertainment/production industries as well as technology (research, development and implementation). I have also spent plenty of time in wood shops on custom projects and artistic pieces. Other professional endeavors include custom cars & motorcycles, radio broadcasting, consulting in various industries (security, tech, knowledge management, forensics and a few other areas) and YEARS ago, a few service companies. That is not a complete list of my professional experiences, though probably the best general picture I can paint in short. Currently I spend plenty of time playing my guitar, working on motorcycles & hot rods, fishing when the weather’s good, and writing. I’m currently spending time on three works of fiction and two non-fiction. The other two are at the very beginning stages, in text form anyway. The two non-fiction pieces are probably best described as “philosophical commentaries”. They each, at this point, have their own unique focus (you’ll have to read them!) though, as I write, I’m finding that they may actually become more than just two works! I anticipate many adventures as I continue this fascinating journey through life and look forward to sharing them with you. Thanks for taking a moment with me!